Terri is a talented art curator, stagnating in a dead end job in London. Her ex-boyfriend, Oliver, is stalking her. A post curating the retrospective of a famous but reclusive artist seems the perfect escape. Portrait painter, Peter Stedding, lives in the mountains of Provence, in a house he shares with his wife, daughter and eccentric sister, Celia. The setting is idyllic; the atmosphere is not: Peter is rude and obstructive, his household strained and silent. The place holds secrets, stories no-one is allowed to tell, dark echoes of the past. Looking through Peter's old paintings, Terri finds a tantalising clue and soon she is caught up in a cat and mouse game in search of the truth. But whose past is she searching for? And whose hides the darkest shadows? Silent Faces, Painted Ghosts is also available as a paperback from Amazon, and by order from Waterstones and most bookshops. It is also in stock at The Harbour Bookshop in Kingsbridge, The Community Bookshop in Dartmouth and Bookstop in Tavistock. My books are sometimes chosen to be read by book clubs and I’m thrilled to know that people are engaging with my stories and characters. It’s also interesting for me to hear your impressions and to see my characters through your eyes. 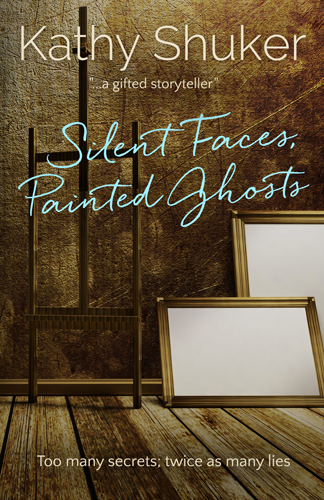 If you have decided to read Silent Faces, Painted Ghosts and would like more information about it, do get in touch. If your club is local to me, I should be happy to come and discuss it with you at a meeting if you would like; alternatively, we may be able to hook up on Skype. I have prepared a list of questions you may choose to consider after reading Silent Faces, Painted Ghosts. Click here to download a copy for your club. Be aware that the questions may contain spoilers!